In the world of linking intellectual properties with amusement rides, we've seen almost everything, from comics to movies, from children's cartoon characters to popular TV shows... There's one type of IP that hasn't been used in the amusement world, and that is video games. 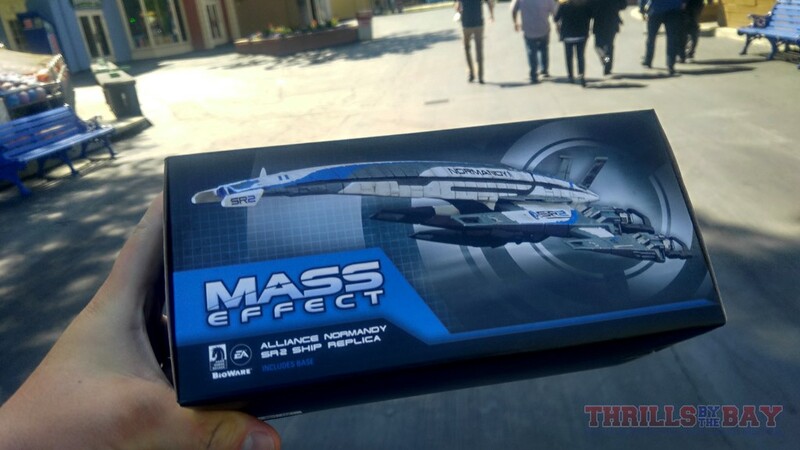 Cool replica of the Normandy ship from the Mass Effect series that we received. 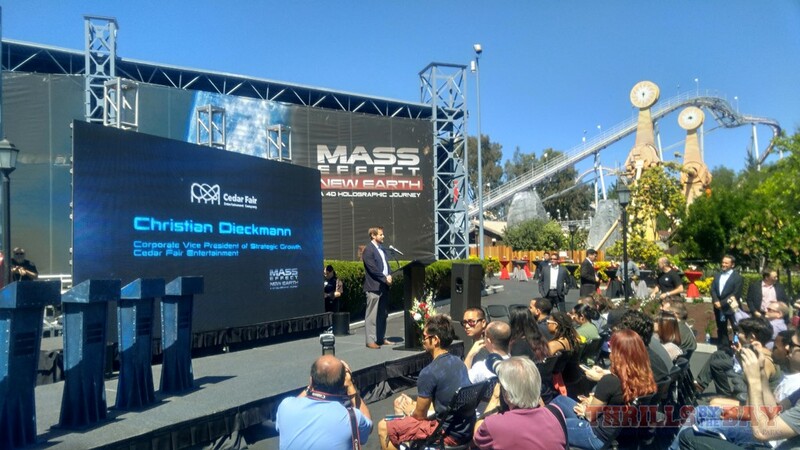 Mass Effect New Earth is based on the critically acclaimed Mass Effect video game franchise and publisher EA Games and developer Bioware partnered with Cedar Fair to revamp the aging Action Theater. AFX has seen a number of ride films in the past but nothing that really stood out and nothing really unique to the park. 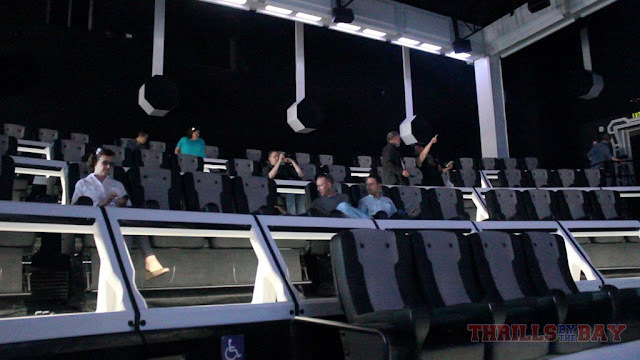 At the end of 2015, the Action Theater was closed and gutted to make way for updated technology including new motion based seats with extra effects that the riders can feel, an upgraded sound system that's capable of beaming sound directly to the riders (has 70 different speakers), and a brand new 3D LED screen. The screen itself is a bit larger than 4K resolution and is made up of a bunch of individual LEDs as pixels. 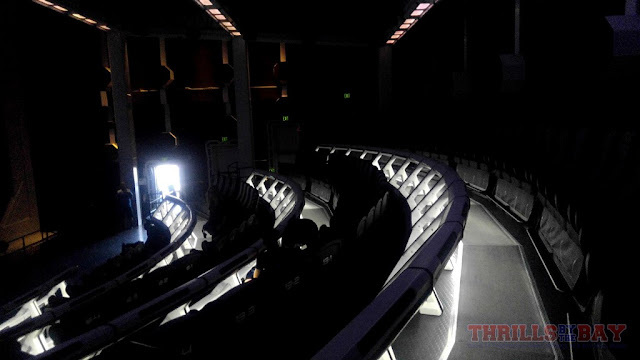 LEDs provide a much richer display of colors and true blacks, and also can provide a more convincing 3D image. The added benefit to the convincing 3D is that riders won't get nauseous. Nausea comes from when the 3D doesn't translate with the riders and in fact confuses their minds. 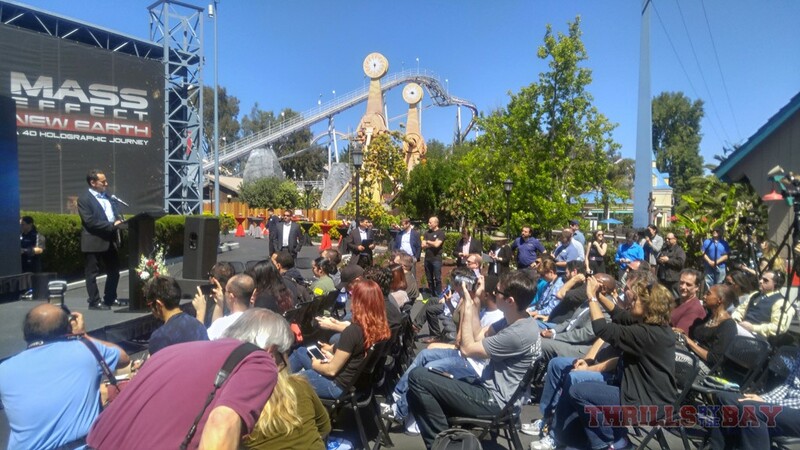 The event kicked off with some opening speeches from EA Games and those involved with the attraction before the Great America tradition of pyrotechnics fired off. Impressions from our first 3 rides on it. 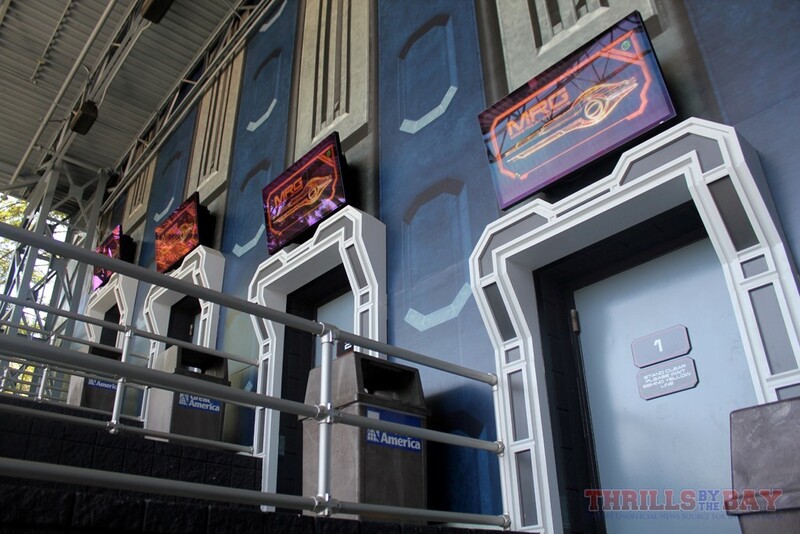 Warning: Spoilers, if you haven't ridden it yet, we recommend skipping this section and going to the photos below. 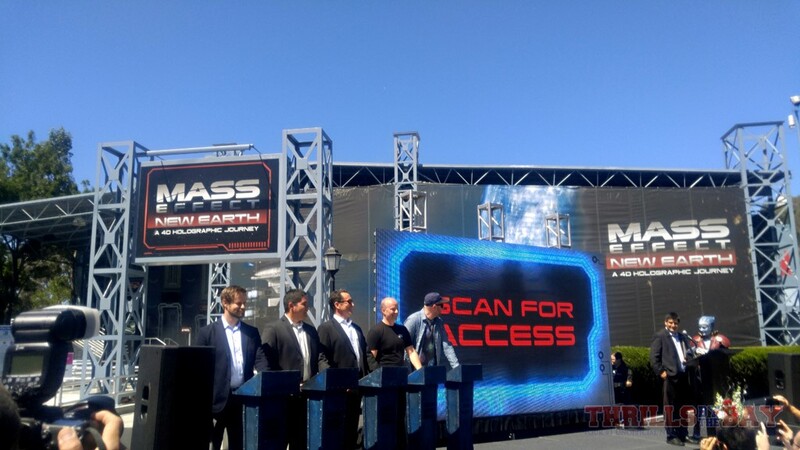 The ride is themed to a getaway to Terra Nova via the Mass Relay Getaways. 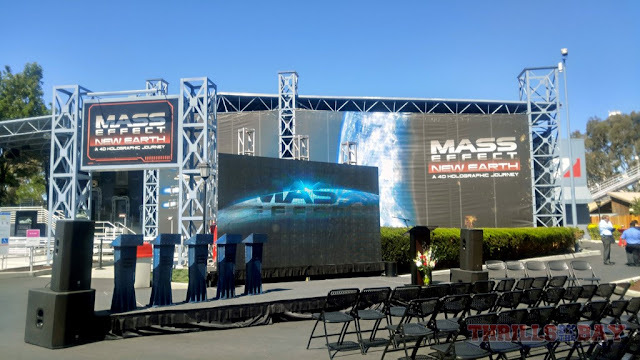 For those unfamiliar with Mass Effect, the Mass Relay is a device that allows one to instantaneously travel between locations. 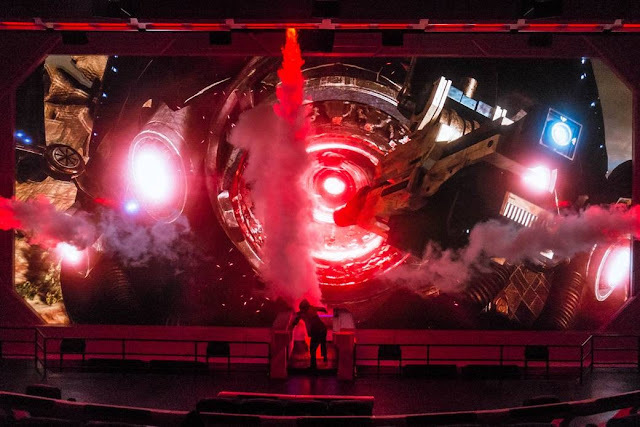 The ships fly by this massive structure, complete with a glowing blue core and a gyroscope and then take off at light speed (which reminded us of the whole light speed sequence on Disneyland's Star Tours attraction). Of course a journey to Terra Nova can't go on without something going wrong. Riders are attacked by one of the game's creatures (complete with 4d effects including water spray and a nasty odor that smelt somewhat similar to the Alviso dumps not far from the park). After getting through the mess we finally safely arrive to Terra Nova. 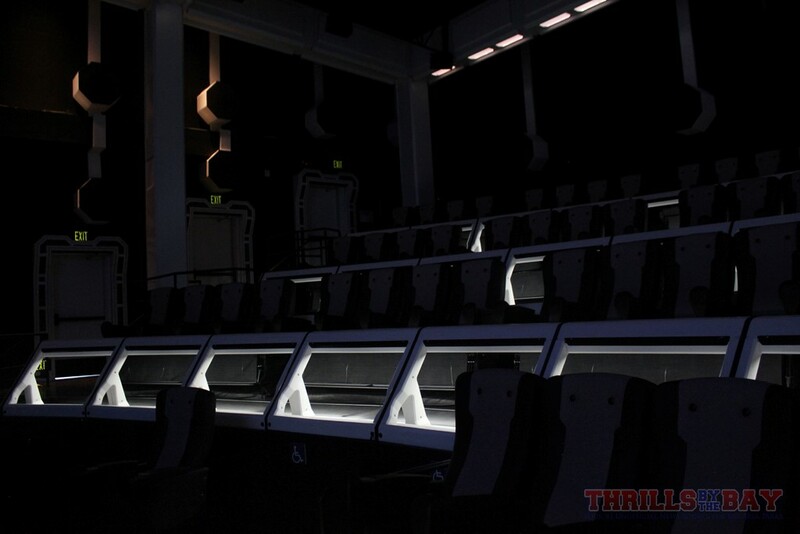 Thoughts about the ride: We were impressed by the high resolution LED screen. Walking into the theater, I had to keep reminding myself that the doors on screen were just illuminated pixels and not an actual physical prop. The crisp images make it look like a physical object. on screen and what is reality. Waiting in line during the summer is going to be brutal as there's no shade in the queue and each showing is about 4 minutes. 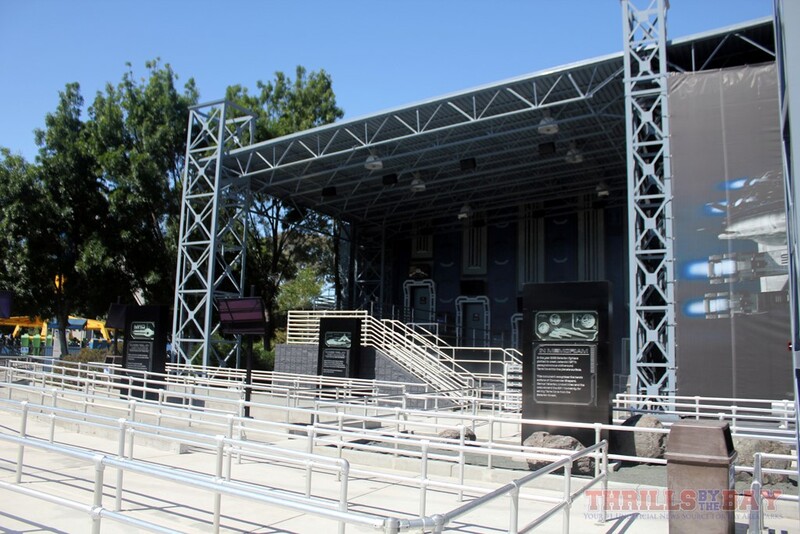 The attraction is definitely worth checking out, just bring some sunscreen and we recommend heading to the ride in the morning when it's cooler or later in the day when the shade from the building covers the queue. 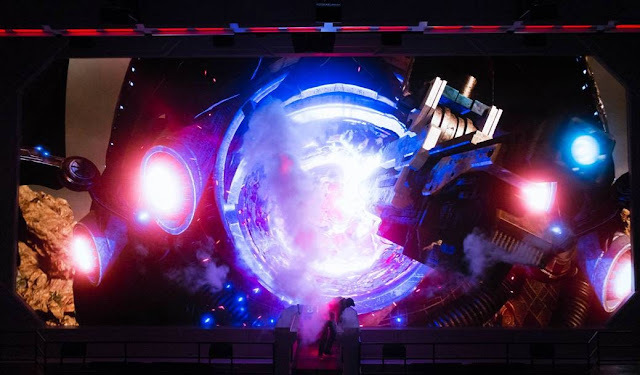 The live actor was an interesting feature and added to the experience. 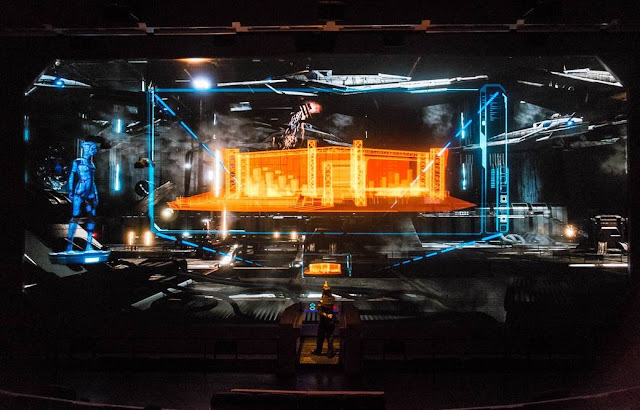 Having a live actor present helped contribute to the 3D effect and the actor in which was our pilot interacted seamlessly with the fantasy world. 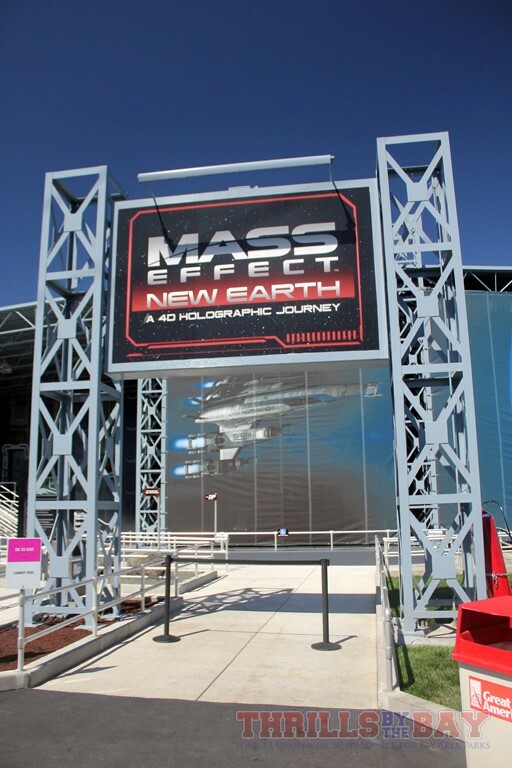 Exiting the ride felt like there could have been something to further show Mass Effect which could have included some props and maybe some video game footage, showing non gamers more about the Mass Effect Universe. Otherwise it's a long gray hallway with a few images. 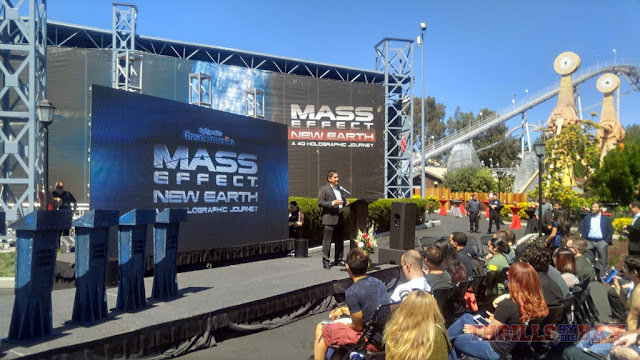 An idea to throw out there if EA and Cedar Fair really wanted to pull it off - set up a few demo consoles where people can play a quick segment of Mass Effect. Originally this area housed an arcade anyway. Inside the theater was really well done and what had done inside there was way more than what we expected. It's no longer just a plain black room with a blank silver screen. 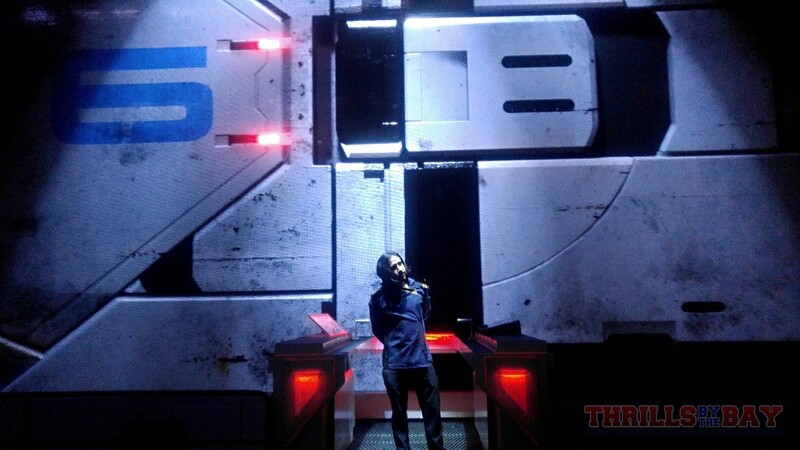 You feel like you're walking into a ship. The "idle image" coming in are the ship's view port doors which look like a physical prop. 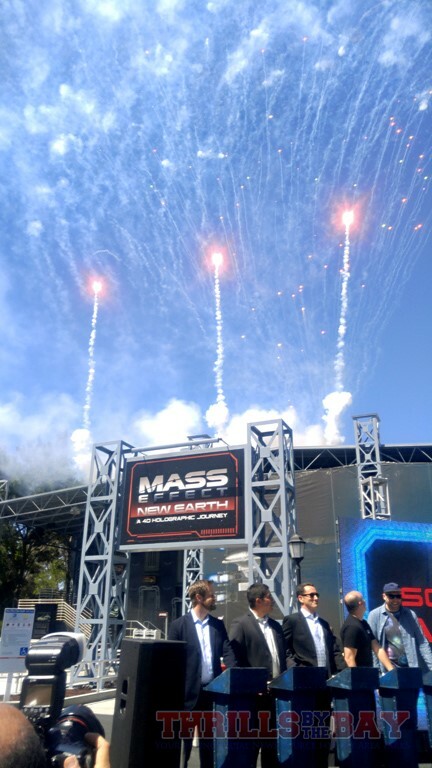 Mass Effect New Earth is enjoyable even for those who have never touched the games, like myself. Gamers will be familiar with some of the in-game characters and such from the franchise also making it an enjoyable experience for them. This ride could even have potential to introduce one to Mass Effect and urge them to buy a copy of the game. We highly recommend checking out this 4D holographic experience and it's a more than welcome addition to the park's lineup of attractions. 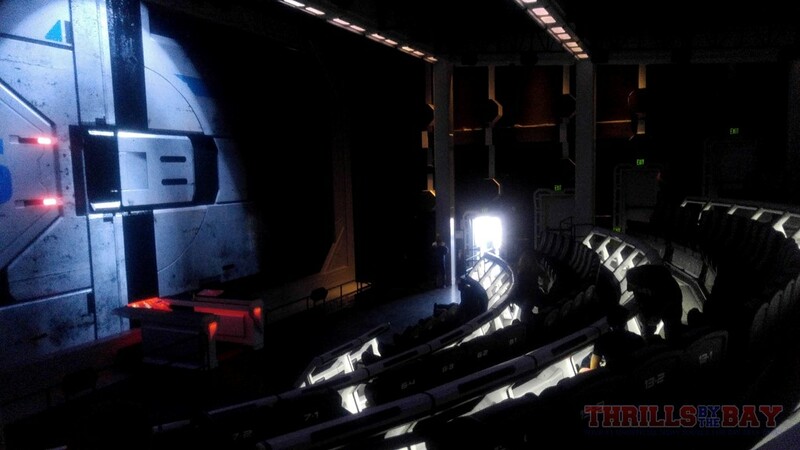 The theming inside the theater was well put together, the attraction itself is enjoyable for both the general public, gamers, and even park enthusiasts. Here is a video (20 minutes long) of the ceremony and an authorized in-theater recording. 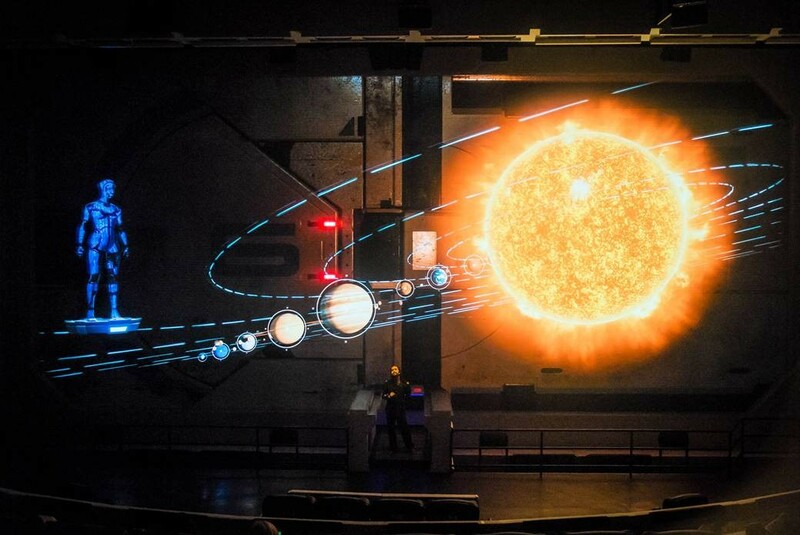 Did you get to experience Mass Effect New Earth yet? How do you like it compared to some of the other simulators out there? Let us know in the comments below.